Departing from Montego Bay, you will drive through Jamaica's scenic countryside, over mountains, through valley's, villages and lush tropical foliage on your way to the Hilton Plantation where you will be welcomed with a traditional Jamaican breakfast. After breakfast, enjoy a short walk down the lazy country road to St. Leonards where the students at the Village Basic School (during the school year) will entertain you with their charming songs and poetry! Then you will be invited to walk the lazy country road to the village of St. Leonards which is only a stone's throw away. 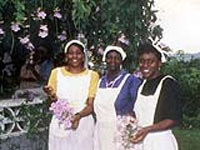 On your return to the Hilton Plantation you will be greeted by an exquisite Jamaican buffet lunch featuring twelve different vegetables and a freshly roasted suckling pig, prepared in a traditional Jamaican brick oven! Enjoy complimentary fruit and rum punch while you are spoilt with true Jamaican tradition and hospitality! Following the luncheon, you will stroll around or relax on the front porches with your dessert and coffee and listen to the delightful melodic music played just for you by the Plantation Calypso Band, before returning to your hotel in time to catch another stunning Jamaican sunset! See the majestic old sacred heart mission in the German Village of Seaford Town. Departs: Tuesday, Wednesday, Friday and Sunday Departure Point: Tour departs from your Montego Bay hotel. Time: 8:00 am 3:00 PM.